I don’t want to have just another ADHD podcast. I really don’t. I mean I listen to all of the ADHD podcasts, and I enjoy them. But I never in a million years thought that I should start my own. Podcasts are for people who understand technology, and have smooth, calming voices. Thinking about all of the technical aspects of a podcast makes me sweat from the armpits. My anxiety starts amping up. But yet…every time I have recorded a podcast I had a ton of fun. 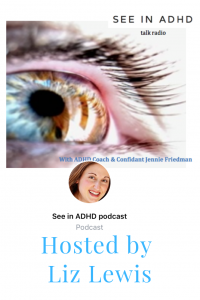 A couple weeks ago my friend Jennie, from See in ADHD came to me and explained that she has outgrown the podcast. She’s really enjoying coaching ADHD professionals. And in typical ADHD fashion I was like, “Yeah sure I’ll do your podcast.” Having no idea how one records, edits, or posts one. Then I had the obligatory ADHD meltdown trying to teach myself to edit in Garageband. So listen to this episode I titled Transitions. Because it’s my first one.